dishwasher, and electrician that I know! especially hanging in the middle of a closet. I didn't need anyone to poke their eye out while getting dressed. The solution was to replace it with a more traditional ceiling canopy. That's when it's really nice to have a hubby with electrician skills. causing so much heat that the paint discolored and peeled. so I didn't want to take the time to re-paint it now. (already stored there waiting for another organization project). 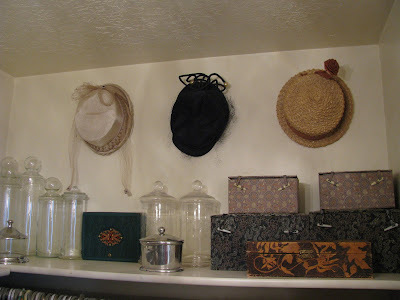 Then I tacked up my small collection of vintage hats. Now it's a real treat to walk into my closet! It is darling and what a clever thought to cover up the electircal box mess. The light is almost too cute for a closet! Love your use of the silver tray. So pretty...what a lucky closet! The silver tray is a very clever idea. The light looks great! I'd SAY your husband has skill! LUCKY YOU!! That looks wonderful. Also, I'm having a giveaway if you'd like to stop by! 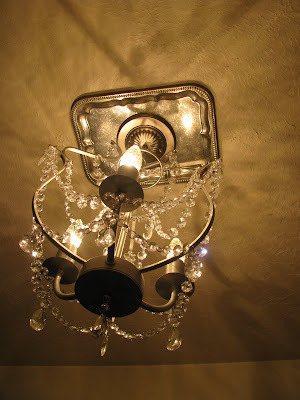 Who knew thrifting could get you something as elegant as a chandelier in your closet? What a sweet reward for all your hard work! Why do people pay full price for anything these days? I still love your blog, you were the first blog that talked about thrift store finds and I have been hooked on buying and transforming used goods ever since. My house looks nothing like it did a year ago, it looks so beautiful now, and I cannot wait until I can one day have as many beautiful collections of items as you do! Your hubby does have skills and oh what a find. Did you do a happy dance in the store? What a great find...and the silver tray throws the light! Great idea. What elegance to get dressed in! So cute, you now need some fun cushions in there and you can go rest all by yourself and no one will bug you. You can admire your beautiful light. Oh my, oh my it is perfect! 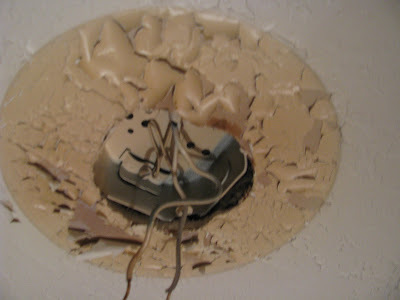 I was just telling my sister today that I had a problem with an ugly spot on the ceiling where the light fixture base was but the new base was smaller. I never even thought about using something like a tray to cover it up! Good thinking with the silver tray! 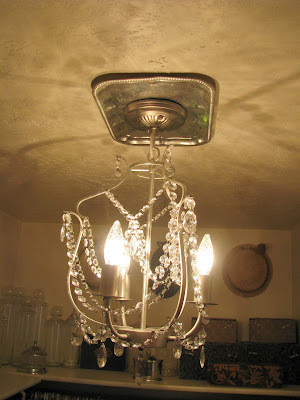 Besides covering up the unsightly cracked paint, it helps reflect the light down to the floor. Good idea! Love the tray solution! Suddenly I will be looking at trays in a new light--hopefully to copy your great idea! Thank you for a wonderful and beautiful blog! Good Golly, that tray is BRILLIANT! I love it. 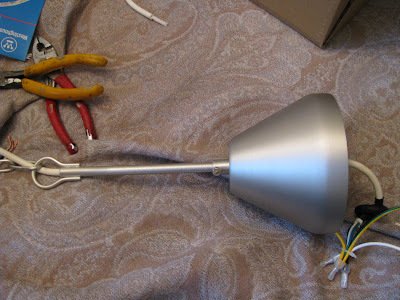 What did you have to do to make it work with the light fixture? And how did you attach it to the ceiling? Ha! I love it. I just told my husband, last week, I wanted to find a small chandy for our closet. He said "a chandy in the closet?" I said "yes". Then he said "Why?" Then I said, "Because I want it..." Sounded like a good enough reason to me... I'll be showing him your post! Clever use of the tray for the ceiling problem. 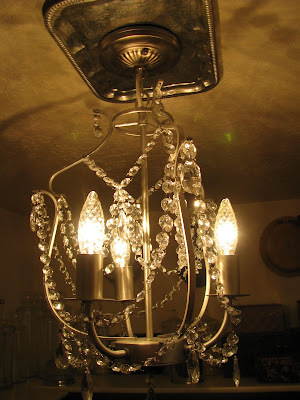 We are discussing the same chandelier at my blog today and someone sent me here to have a look-see. I don't know what IKEA was thinking when they designed that thing. I am SSOOOO jealous! I want a walk-in closet with a chandeleir SO bad! Or just a walk-in closet would be nice. 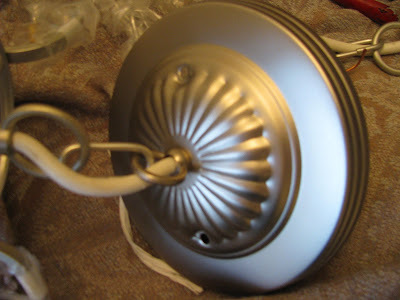 I love the silver tray as a ceiling medallion. Very clever! In love with the tray! :) Great idea! Looks terrific. Great job to your hubby! It looks pretty . . . he did a good job! I love the tray on the ceiling!! So creative!